mp4UI is a utility for creating MP4 video files. MP4 files are high-compression ISO-compliant MPEG-4 streams with AAC audio. You are able to edit file/track properties and metadata, as well as import/export individual audio/video tracks. Download the installer and install to the default folder C:\Program Files\mp4UI. Copy all files (except Uninstaller.exe) into a folder of your choice. You cannot actually view i.e. 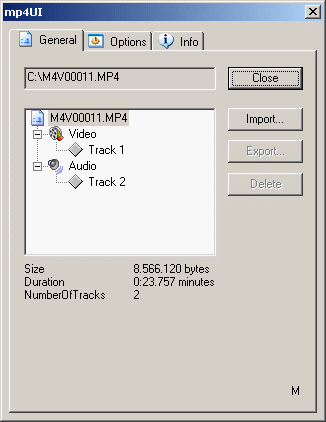 Watch the mp4 video, with this useful utility.